26 May 2013: I have finally made a start on the re-plumbing of the panels (where the leak is occurring). I am glad I didn't start earlier in the week and then have the strong windy conditions of last Friday. Unfortunately, the system is missing several days of good sunshine, but that is all greater incentive to get on with the task. The first ETFE panel is lifted off and stowed carefully to one side. Both ETFE panels are off and I can see where the leak is coming from. The 40mm compression joint was good for a year, but then it began to leak from one joint. This was a bit of 'working on the cheap' that worked OK for a year, but has now cost me a lot in wasted glycol, scaffolding, time, worry and lost sunny days. Waste pipes are normally dry, i.e. 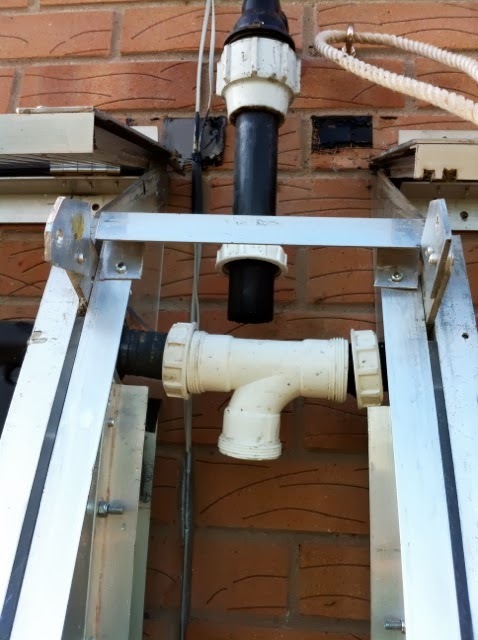 the liquid flushes away and are not really good for a permanently filled pipe with occasional pumping or thermal pressures. 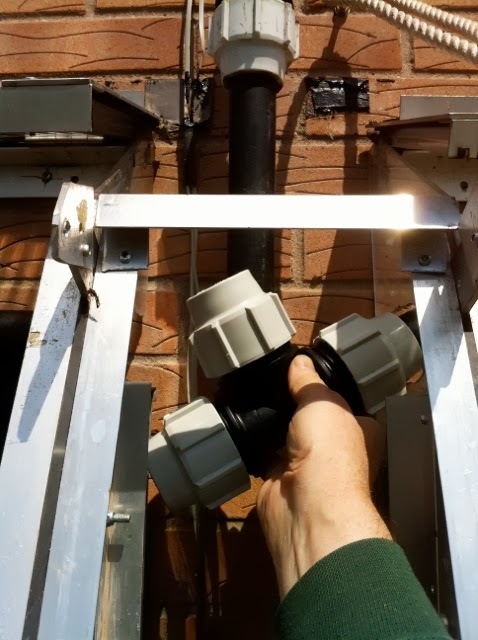 I should have done more research on other piping solutions. Here is the junction with all pipes taken out, and I need to insert a replacement Tee-piece. Unfortunately, the Plasson connector will not fit and gave me some hours of despair. 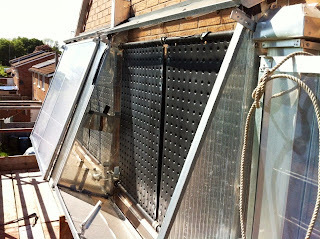 I even considered taking the entire system down and relying only on the new roof mounted panel. 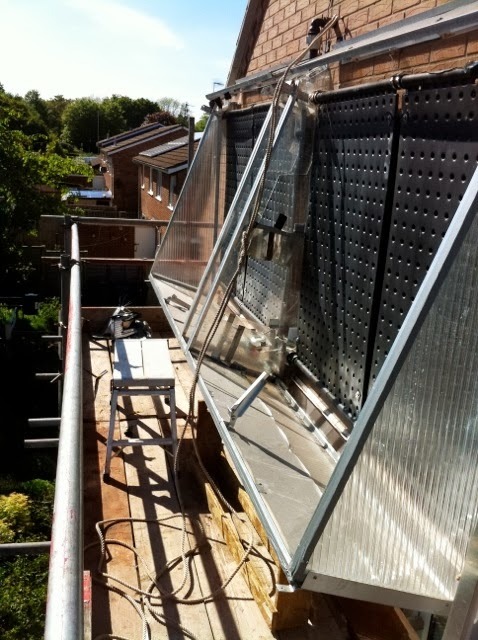 When the panels were originally built (with a Plasson fitting) it was difficult then, but with all the polycarbonate casing and the metal, it is now quite impossible to get a Plasson back in. 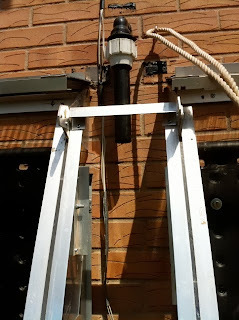 Taking the system down is inconceivable not just because of the holes that would be left in our wall, but because it it my research topic and the main purpose of this blog! It is proven to reduce the consumption of the heat pump, so it needs to continue working! I spoke to a near-neighbour, Chris Bright, who also happens to be an engineer at Rolls Royce, and he suggested that there were other tee-pieces that I could find that would be good enough. 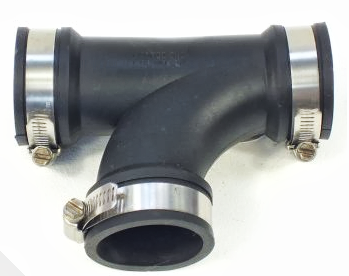 I kicked myself for not having tried harder a year ago when I had weakly assumed that the compression waste fitting would be good enough. 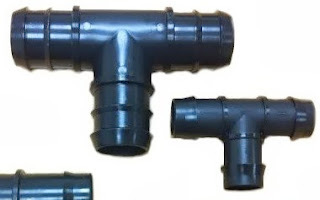 This item is a 'rubber' tee piece that can be pushed into position, but needs a rigid pipe connector to the panels either side. Also, I don't need directionality of flow, nor a doubling of the number of jubilee clips. This above is the ideal solution. With a 'male' tee-piece, I can have one flexible 40mm hosing connection to each of the panels at the side - fewer jubilee clips and reduced opportunities for future leaks. By the way, it is only about three pounds! I have ordered one of these by post, and it'll arrive during the week. There is a local company, Tennant Rubber, who have a vast variety of rubber and plastic hose types, and I can choose more of what I used before, of the more flexible type.